You have got to try these Flourless Chocolate Brownie Bites! These are so tasty! You only need a handful of simple ingredients to make them. These flourless chocolate brownie bites are very decadent in taste and texture. Don’t let the avocado in the ingredient list scare you. You can’t taste them at all. Just like with my avocado chocolate chip cookies or my fudgy flourless brownies. I was licking the batter off the spoon! These are the perfect bite for when you need a little something sweet. If you like these, you may also like my flourless chocolate muffins. EDITED: I made a no bake version of these yesterday and they came out great! Instead of baking in a muffin pan, I dropped the brownies onto a lined cookie sheet and chilled. They were a little soft, but still easy to handle. I served them at a party in paper muffin liners and they were devoured. I recorded a video of the no bake version for you below. For more videos, you can subscribe to my You Tube Channel. 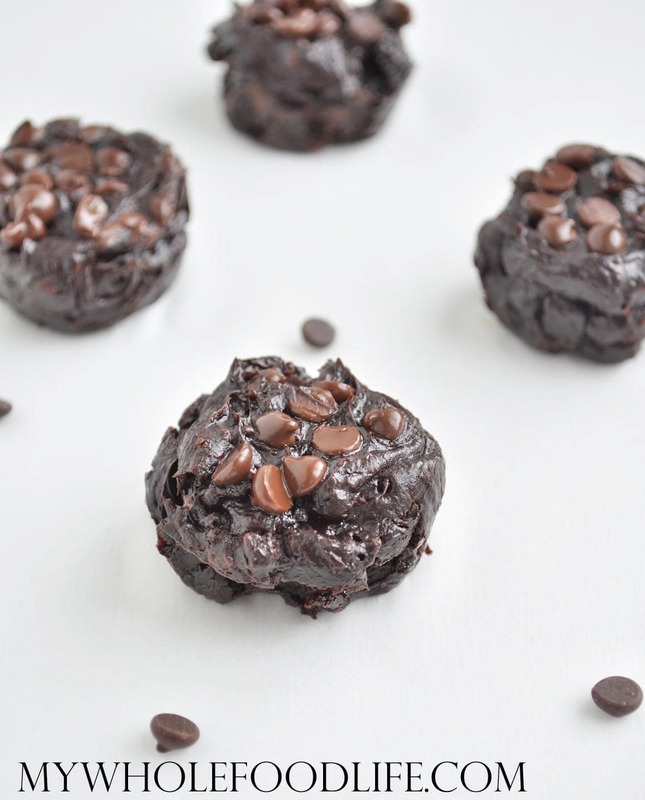 All you need is 4 simple ingredients to make these healthier brownie bites. In a food processor , combine all the ingredients and blend until smooth. Make sure the avocado is completely blended up. You don't want avocado chunks in your brownies. Spoon batter into a lined or greased mini muffin pan . The batter will be VERY sticky. If you are using paper liners, you may need to grease them to make sure the brownies don't stick. Let the brownies cool completely before removing from the pan. One thing to note is that since these brownie bites are flourless, they are very soft and fudgy. Keeping them in the fridge may firm them up some. These should last at least a week in the fridge. You may also be able to freeze them, but I haven't tried yet. Enjoy! Hi Melissa..If I don't have a mini-muffin pan can I make mini cookies out of them? I typed in a wrong letter on my e-mail address if it makes any difference for my message ...just corrected! Yes, but put them in muffin liners on the tray if you can. Hi - I was wondering if you could tell me the approximate measurement for the avocado flesh? (in cups or grams) Thanks! I made these for a Luau potluck at my gym. They had a contest for the best recipe and these won. :) Several people requested the recipe. They are surprisingly rich and chocolaty. I've frozen some and they were still good as well. Great way to use an avocado that needs to be eaten. Also great for a treat you don't feel too bad about. YUMMY! Thanks!